Agencies and institutions from both government and private sector are invited to participate in this year’s celebration. 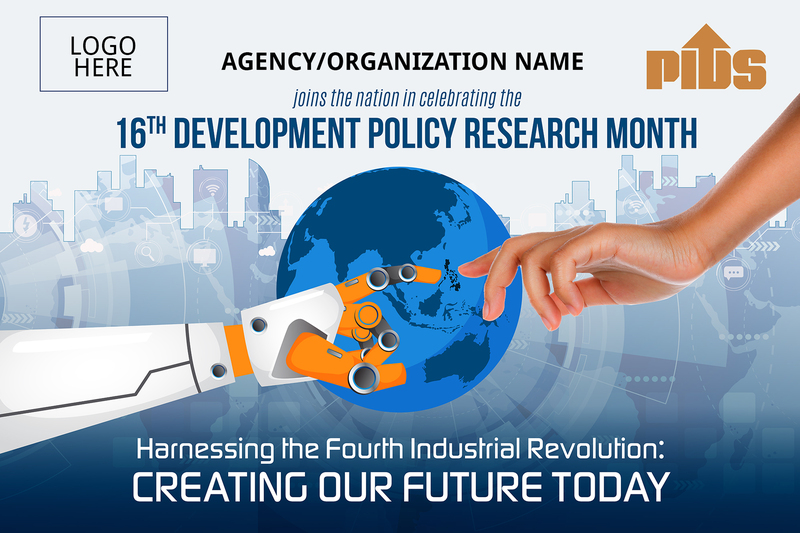 An agency can participate by organizing events related to policy research, featuring announcements and articles about the DPRM in its dissemination outlets (publications, website, social media accounts), and displaying the DPRM banner/streamer within its premises. The DPRM banner is available in two versions: English and Filipino. Just choose the version that best suits your area’s language preference. The DPRM banners may be downloaded in their actual sizes (recommended size is 200 cm x 150 cm) from this URL: http://bit.ly/dprm2018. Open the JPEG file using Adobe Photoshop. The image shows the English version. Insert your agency/company’s logo at the top left portion of the banner and your agency/company name beside it as shown in the image. If you have questions, please email us at inquiries@mail.pids.gov.ph.